Love it or hate it, the smartwatch is a category that seemingly every manufacturer still wants to conquer. No matter how many devices debut, and no matter how they perform, it seems there are those companies who still think that they have the right solution. According to TechCrunch, @evleaks, and others, Google is one such company, and plans to debut its own smartwatch before or during this year's Google I/O conference. What's more, the watch is rumored (by TechCrunch and other sources) to be manufactured by LG. While many posited before that the watch would be made by Motorola (we've seen a Motorola prototype), LG manufacturing the device wouldn't be a total surprise. After all, LG and Google have by all appearances worked well together on two handsets, and it was just last month that Google's CFO, Patrick Pichette called the LG-made Nexus 5 a "very strong" performer. This isn't the first time we've heard wind of Google working on a smartwatch, either. 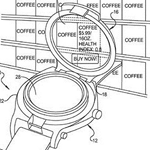 A patent was granted to Google in late 2012, and in March of last year we heard further rumors of a watch being developed by Google's Android team. The Wall Street Journal re-upped the rumor in June of 2013, adding that Google may be working on a video game console and a new Nexus Q.
TechCrunch's sources (the unflappable "people familiar with the matter") confirm that designers from the Android team are involved, and say that the watch "is "officially" expected to begin shipping in mid to late March," though there are concerns over the product's completeness, leading some to believe the release will be pushed back to June, or that the watch will ship with an incomplete feature set, gradually expanding its capabilities with future updates. As for the device's looks? PFWTM say an early prototype had a metal band and square face, while the interface featured a gradient-based live wallpaper that gently cycled through colors. TC's sources say that now, however, there is rumor that the watch will ship with a plastic band in its initial release. As you'd expect, the interface is said to be gesture- and tap-driven. Of course Google Now may feature prominently on the device, and - like Google's other wearable - the watch will seek to preclude users checking their phones for notifications and other simple interactions. Interestingly, @evleaks tweeted that the watch would "apparently" launch at Google I/O. With Google I/O taking off in late June, this would match up with the rumor that the watch's availability will be pushed back. Apparently Google's smartwatch is being made by LG, and will launch at I/O. Of course, all of this is still a rumor. What we can say for sure is that at some point Google was working on a smartwatch, and that recent rumors suggest that watch is nearing completion. It may or may not launch soon, but it at least appears to be making forward progress. Unfortunately, though, it looks like that flip-up viewfinder is on the cutting room floor. For TechCrunch's full story, hit the source link below.